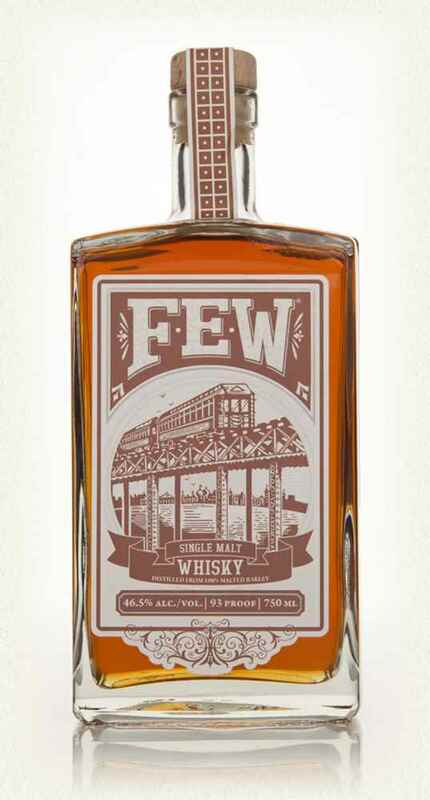 This week we’re taking an in-depth look at the FEW Spirits lineup. So far we’ve reviewed the FEW Rye, American Gin, Bourbon, Standard Issue Gin, and Barrel Aged Gin. Finally, we wrap up with the crown jewel in FEW’s portfolio – the single malt American whisky. It hits you straight up the nose with corn. There’s a definite bread quality dominates the nose. It settles on a bit of vanilla and oak on the end. The nose definitely informs the taste of the single malt. While they say its been distilled with both smoked and unsmoked malted barley, you definitely don’t get much of the smoke neat. It has very distinctive nutty flavor. Wholly unique. Not bad, but certainly a different beast. Seems like its heavier on the sweeter side than I usually prefer, but the roughness waylays that sweetness. The addition of ice really opens up the complexity of the whiskey, although it does seem a bit single-note for a single malt. The oak becomes a lot more prominent, and tones down some of the “bread-ness” from the corn. It lingers long, with an earthy flavor and the grain lingers.